“Blown head gasket" can be one of the scariest phrases in car culture. At DJ Foreign Auto Care, we know this is true. Even non-car people know the term and know it can be an expensive fix. Let's talk about your conventional head gasket, how to tell if you blew a head gasket, and steps you can take to prevent a blown head gasket. A head gasket is a seal placed between the surfaces of an engine block and the cylinder head(s). A head gasket, being part of the combustion chamber, helps to contain the combustion process for you to have a functioning engine. The head gasket provides a physical extension of the fluid passages from head to block. The fluids in your engine all serve a different purpose, so they need to stay separated while still operating in very close areas. The head gasket needs to be extremely hardy, due to being so close to the combustion process. Many head gaskets are made of composite materials or steel, with copper being used in high-performance applications. Although the head gasket is critically essential to the engine, new head gaskets are surprisingly affordable. 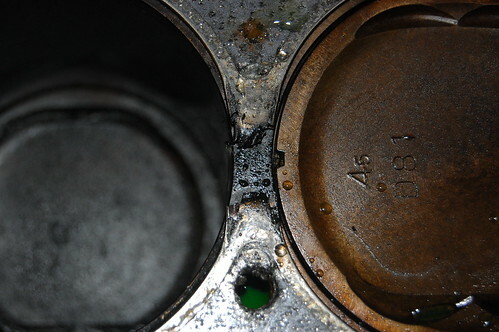 The cost of head gasket repair is due to the labor involved with removing the cylinder head. -Coolant leaking from beneath the exhaust manifold. -White smoke from the exhaust pipe. -Loss of coolant with no visible leaks. -Bubbles in the radiator or overflow tank. -Low power or poor running engine. The simplest way to prevent head gasket failure is to ensure your engine doesn't overheat. Check the radiator and coolant overflow tanks anytime you check your oil level. Add coolant as needed, and watch for any unexplained fluid loss. Check the radiator hoses for splits/frays, and replace at the first sign of damage. Watch for fluid leaks under your vehicle and any unusual smoke. We will happily do these things for you at DJ Foreign Auto Care. Signs of a blown head gasket will differ by the engine and by the particular way the gasket failed, so take any of symptoms we listed above seriously. While blown head gaskets can turn into serious engine problems, a properly installed replacement gasket should get your engine as good as new and last several years.